Bif Bang Pow! blasts off for action with this line of fully articulated, 8-inch tall action figures based on Adult Swim's all-the-rage animated series The Venture Bros. You'll find the most popular and recognizable characters from the show faithfully represented in real fabric clothing and a 1970s retro style that accurately portrays that distinctive action-comedy mix that has become synonymous with the TV series! Each figure comes individually carded in blister packaging. Ages 18 and up. Also known by the moniker "Holy Diver," this former O.S.I. agent and current member of SPHINX prefers guys to gals and firearms to melee combat. Complete with tattoos, a watch, and not one but two pistol accessories, Shore Leave appears in a recognizable fabric outfit that includes a vinyl collar, belts, knee pads, and boots. 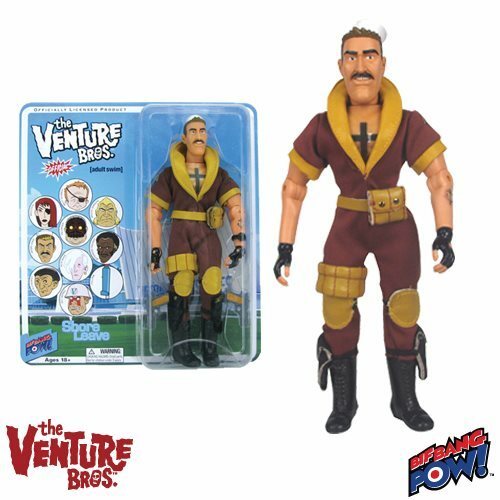 He'd prefer to go home with you to your The Venture Bros. collection, rather than staying here at Entertainment Earth. What do you say? They're ready and waiting for your toy box or collection shelf!